Mom's Gone Bronson! : Simple Frosted Pumpkin Cake! Yum yum yum! I am currently obsessed with making pumpkin cake! I don't make it all the time but I really love the idea of it!! It is SO simple and all you need is a boxed cake mix and a large (29oz) can of pure pumpkin! It doesn't matter what kind of cake mix you use but I prefer to use white or yellow! You just throw that in a bowl with the pumpkin and fold in together and then mix with an electric mixer on medium speed for a few minutes to get in a little air. Once mixed in you will pour the cake mix into two 9 inch round tins and bake until firm and cooked all the way through. I cook them at 350 degrees until done - time varies by oven and it is best to keep checking the cake/s until ready on your first go around and not the time it takes for you personally for easier baking next time! You will know that the cakes are done when you can put in a butter knife or tooth pick and pull it out clean. 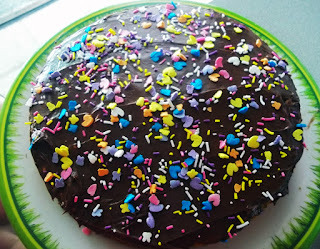 When cooked you will need to leave the 2 halves on the side to cool down and when they are you are going to take one half and spread frosting on the top (you can choose the kind of frosting to suit your tastes but cream cheese works very well with this kind of cake). You will then take the second half of your cake and place that on top and frost that too. You can either frost it all the way around the sides or just the top, it really is down to personal preference! 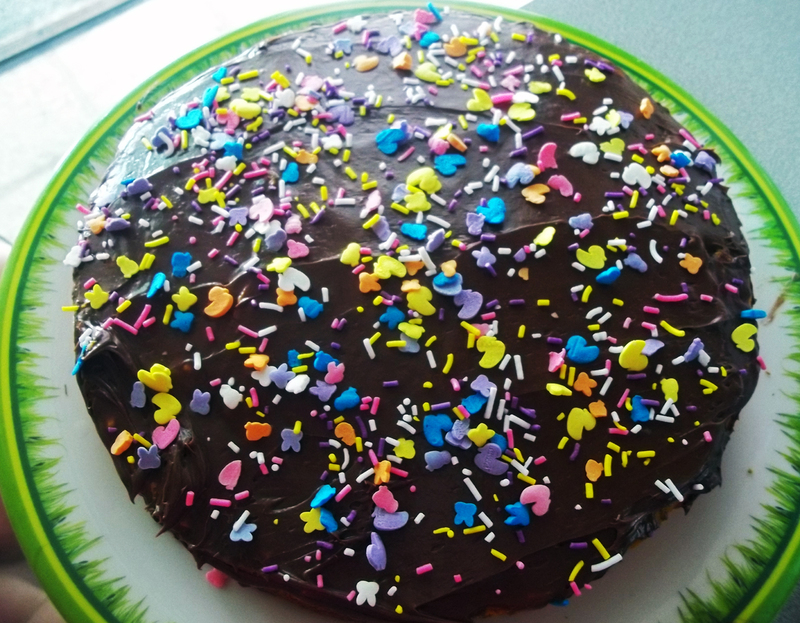 I usually then add sprinkles and the cake is done! Put the cake in the fridge for an hour or more to settle and serve it up with a nice cup of hot tea or coffee! This recipe makes 8 decent slices or less depending on what you call a decent sized serving! To mix it up a little, you can try this cake with whipped cream in the middle or a sugar dusted top instead of using frosting! You could even add fruit to the mix or stuff fruit in the middle! You could even make it with apple sauce instead of pumpkin and it really is just as simple and delicious - it is also a great way to get your picky eaters to chow down on some apples, pumpkin or whatever else you can puree to put in it!! No eggs, no sugar and no oil added extras, just your box cake and your mix-in! Yum yum yum!! Let me know if you've ever tried this before and how you might do it differently - but most of all, ENJOY!